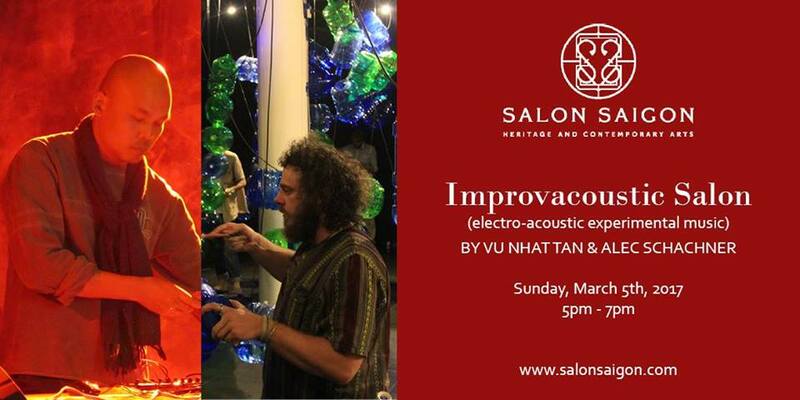 Composer Vu Nhat Tan and sound artist Alec Schachner will return to the audience of Salon Saigon with an interactive experimental performance, using eclectic insturments as well as their conceptual knowledge of music and sounds, to create improv pieces – a convergence of two styles of music: techno and acoustic. Vu Nhat Tan is a Vietnamese composer of experimental music combining orchestral/chamber/piano, electro/computer and multimedia performance. He studied piano, composition and musicology at the Vietnam National Academy of Music in Hanoi, computer music and new music at the Staatliche Hochschule für Musik in Cologne and composition with Chinary Ung at the University of California at San Diego. Alec Schachner is a multi-genre musician, sound installation artist, independent scholar & poetry translator. His sound installation work over the past several years has focused on creating viewer-interactive/immersive audio spaces by using voltage-generating piezoelectric contact elements to transform everyday objects and materials into sound-reactive instruments.